businesses are required to objectify the principles in letter as well as in spirit. Businesses are required to conduct and govern themselves with integrity in a manner that is ethical, transparent and accountable. Businesses are also needed to provide Goods and Services in a manner that is sustainable as well as safe. Businesses should also respect and promote the well-being of all employees, including those in their value chains. What To Know About India’s “Responsible Business Conduct” Guidelines. 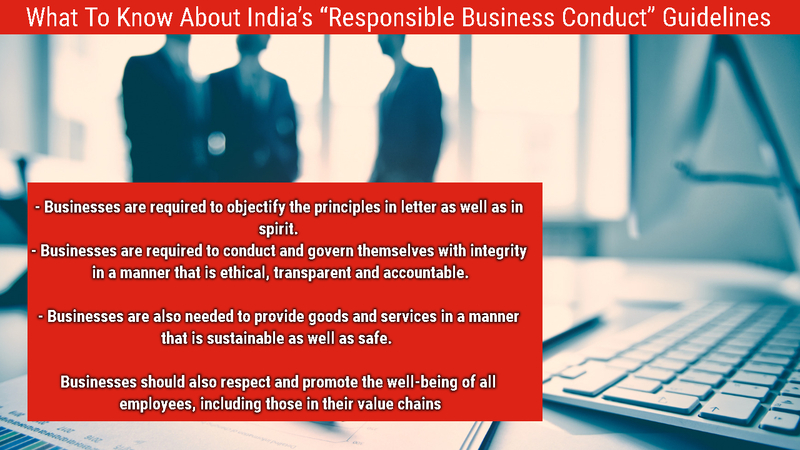 Ministry of Corporate Affairs has recently released national guidelines on responsible business conduct. According to the guidelines, the businesses are required to objectify the principles in letter as well as in spirit. An official statement stated, the Ministry has revised the National Voluntary Guidelines on Social, Environmental and Economic Responsibilities of Business, 2011 and formulated the National Guidelines on Responsible Business Conduct. The guidelines also stated businesses are required to conduct and govern themselves with integrity in a manner that is ethical, transparent and accountable. The guidelines further said, the businesses should also respect and promote the well-being of all employees, including those in their value chains. According to Ministry, various initiatives have been taken in order to ensure responsible business conduct by businesses.